Etihad Rail Job Vacancies in UAE. Etihad Rail which was once known as Union Railway. This company develops and complete the construction on of the railway network that is located in the United Arab Empire. The company is installing 1,200km of railway and it is going to be done in several stages. This will be a major part of the Gulf Cooperation Council railway network. The railway is being developed with the Abu Dhabi Economic Vision. The entire project is not expected to be completed until 2030. The railway will be used to connect trade centers and will help increase economic growth. People will be able to travel for work without a problem on this center and they will be able to expand their job search since they will be able to travel using the railway system. This company has been in business since 2009 and was created under the Federal Law number 2 in order to manage the railway system. The railway is going to connect the trade from the United Arab Empire and link it to Saudi Arabia and Ghweitfat to the west. The railway will also link this country to Oman in the eastern part of the country. The railway will be able to hold as much as 300 lorries which will be better for the environment. Why Work For Etihad Rail? With all of this work that needs to be completed Etihad Railway is looking for qualified employees. There are many Etihad Rail job vacancies in the UAE and there are some good benefits that go along with working with this company. This company is looking to change the way that the UAR does business and this will never be the same once it is completed. When a person works for this company they will receive training. They will get their training from top members in the railroad industry. They will also receive a mentor within the company to help them along the way. The team is looking to hire qualified people from all around the world. There is a lot of work that needs to be done and a person can enjoy job security for many years to come. 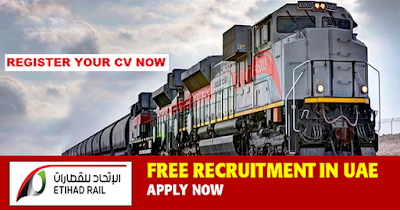 It is easy to apply for a job with Etihad Rail. A person needs to go to the official site and they will be able to look at the different jobs that are open with this company. They will need to register for a user account. This account will include their name, contact information, and relevant experience. A person will need to upload their resume and it is recommended that they upload a cover letter as well. The cover letter can explain a little as to why a person wants to work with this railway company. There are also job sites such as Glassdoor where a person can find out more information about the company and the direct link to apply. A member of the Rail recruitment team will look at the resume. Once a relevant job opens a member will send an email about the opportunity that has come up and will schedule an interview. Etihad Rail has a great deal of work developing a complete rail system in the United Arab Empire. This company is looking for quality workers to become part of the team that will transform the economy of this country and makes it easier for people to have more economic opportunities. Latest Job Vacancies at Dubai Chamber. Dubai Chamber is a non-profit firm whose mission is to support, represent, and protect Dubai business communities. It does this by creating an enabling environment. It acts as an international trading hub and supporting business development. Dubai Chamber continuously streamlines its operations to facilitate the establishment of businesses in the emirate, enhancing Dubai's mission to become a global trading hub. By overcoming economic changes around the world, Dubai Chamber occupies a leading position not only in the UAE and in the GCC, but also globally, by serving as an information and research center, providing business documents, providing legal services, Facilitating communication and service delivery opportunities. It is good for almost every conceivable business solution. Because of their commitment, they have opened doors for people looking for work. The Legal Advisor is responsible for providing legal services to companies and legal aid internally for the DCCI. Legal services contribute to the objectives of the Dubai Chamber in creating a favorable and favorable environment and supporting business development. The work of the program manager will help in leading the development and implementation of CSR and relative value-added services. He/she will lead comprehensive business activities, and facilitate the provision of support services, in a successful manner and in line with the standards, objectives, and room established by Dubai Chamber. The Director's mission will be to add value to the Dubai Chamber's Business Excellence Awards programs in the UAE and across the GCC region, from integrated project management to high-quality goals in accordance with time requirements. Project management standards, standards, and objectives set by Dubai Chamber. The legal researcher will provide legal and administrative support to the situation management team to enhance the management of the situation with great efficiency. The economic manager will conduct high-quality economic and trade research related to Dubai Chamber members to support the Dubai Chamber to create a favorable business environment, support business development and encourage Dubai as a global business center. Just take a few minutes to create or edit your employment profile and set your preferred business criteria for future openings that match your interests. • Development and learning opportunities. • Access to dynamic and safe work areas built according to the latest environmental standards. • Provide a workplace that is safe and health. 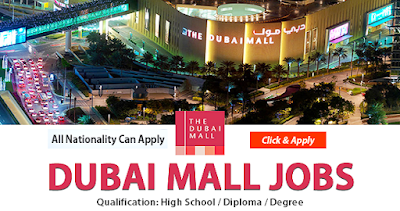 Latest Job Vacancies in Dubai Mall. The Dubai Mall is located next to the largest building in the world, Burj Khalifa and the beautiful outdoor lands. In the shopping center, you will find a vast and beautiful aquarium that won the 2008 Guinness Book of the most massive plastic panels in a piece of the world. At the Dubai Mall, we can find a location where you can find many restaurants that have fast food. All these facilities give Dubai Mall the ability to employ many people to serve customers who are flooded every day. Below are the latest vacancies at the Dubai Mall. Office agents must be fully trained on how to make a reservation. Just think about the amount of lost revenue because the client did not know how to sell the ticket. If you take the time to contact him to ask, book these children regardless of the reason. The caller will hang up and schedule the next hotel that was smarter and got a sale. To be able to apply for this position, you must graduate from a prestigious university. That is because you must handle calls and customers. Must have a courteous and personal appearance and must have excellent interpersonal skills. Computer skills will be an added advantage. As you interact with different types of people throughout the day, you should be able to maintain your peace of mind and patience without provoking the situation. Through his passion for the brand and the product, he will lead his team to provide exceptional service while providing a unique experience. You will be responsible for the effective operation of your department and the management of the general operations of your store by the objectives and actions of your store. The work in customer service is the activity that is given to the customer to increase the level of satisfaction, the more satisfied the customer is, the better the service will be. The client's work involves attention or the hospitality profession, and a large sector of the work environment requires this type of service. The main task of the store manager is to successfully lead sales by ensuring that all standards regarding performance, operations and equipment management are consistent with the values and guidelines. The store manager is responsible for developing the business and achieving the objectives, by building a base of loyal customers through craftsmanship, quality of materials and creativity. When job seekers find a company, they love that they will start to make progress in every available job. That is because they want to attract the attention of the recruiter. You recruit and feel that someone has requested more than ten positions within your company. What is your first thought about you? So, why make a recruiter a job that suits you? Recruiters do not have enough time in today's high-volume, high-speed environment. What they are doing is merely going to the next CV if they have a lot of them. 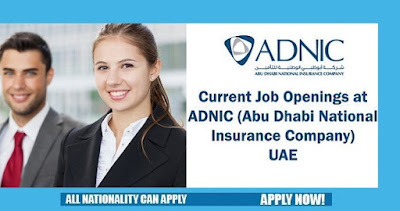 Jobs at ADNIC (Abu Dhabi National Insurance Company) UAE.ADNIC is an insurance firm located in Abu Dhabi, the parts of United Arab Emirates. As of May 2015, it was ranked the third insurer company that you could find in the country. It was started in 1972 as a section of Abu Dhabi Investment companies. It provides both non life insurance and life products to aviation and marine businesses. Its main corporate offerings are in the property. The company has a plan of expanding its services to North Africa and the Middle East hence providing more employment chances. They offer you a career and not just a job. A career in which you have the opportunity to learn, explore, realize the potential of your life. It is about fulfilling your professional aspirations in a challenging and pleasant environment. They are driven by performance and appreciate the results. They are interested in participating and allowing you to give your best. We have implemented a variety of methods to ensure that our employees have their support, boost performance, growth, and improvement. The recognition of achievement and contribution is a continuous process and is carried out several times throughout the year. You will get flexible work, time for continuing education, leave, and nursing time, join in sports work, family day and blood donation campaigns are some of the facilities made to change a family culture and change the balance between family life and work. Their rewards program is designed to compete with the best in the industry. They provide you with attractive salaries and subsidies and include benefits to recover club membership, medical coverage for you and your family, and airline tickets. The incentives are based on the performance of all the groups of personnel. You will get opportunities for growth, learning and skills development are available through various channels: promotions, transfer to other roles, project-based tasks, formal training programs, participation in seminars and conferences. Abu Dhabi National Insurance Company grows significantly. They generate many jobs every day. People who are tortured for a future career can now begin their careers by clicking on the CAREERS section then the going to the CURRENT OPENING JOBS. You have the freedom to choose your profession in this company that offers many opportunities for personal growth. They have introduced emerging technologies, increasing the number of jobs for skilled and semi-skilled workers. When working with Abu Dhabi National Insurance Company, you have your job security, stability, and monetary benefits. If you want to start your career with Abu Dhabi National Insurance Company, you can search for current ADNIC jobs in ADNIC official website. Here you will find amazing jobs that will fit your professional. The working life at ADNIC is fantastic and provides satisfaction to employees. The work culture is adequate and flexible enough to increase the employee's commitment to the company. With ADNIC you will be sure that your job is secure and you are working with the right company with the proper working culture. New Job Vacancies at Qatar Aviation Services. Coaching for job interview mostly aviation is an excellent personal investment because a proper preparation helps you to increase confidence since a sure job applicant will have a good reach to get the job. If you want to be the best candidate for the flight attendant or pilot, get a job interview to help you in the aviation jobs. These are not good days for many companies, since the high inherited costs, the high cost of fuel and inefficient management practices. 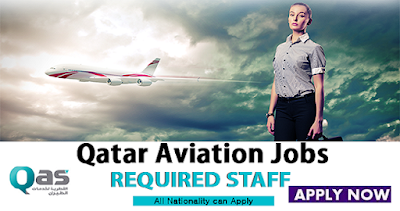 But with Qatar Aviation Services, there are new job vacancies for you. Fortunately, not everything is sterile and exposed in the industry, and many jobs are being created for the person who takes the opportunity as a challenge. There are countless people interested and without degrees in a career in aviation. Qatar Aviation Services are hiring people, and the industry continues to expand. There are new job vacancies for almost everyone, including you if you are willing to do it. Today, the aviation industry is one of the sectors with the best profits, serving people around the world. Being the best business to make money that reaches the market, a person can recover a prosperous future in the sector. With each successive year, business prospects with the aviation industry are increasing, which provides excellent aviation jobs to all so that they can make their future in this industry. An amazing option for people interested in adding some skills to their career can be air services. For a pilot, the initial requirement is to obtain a commercial pilot license. In the current economic climate, many pilots compete for every available New Job Vacancies at Qatar Aviation Services. Find out how accurately and quickly you can complete an online application form and beat the competition for the job. Aviation is subdivided into three main groups: general aviation, military aviation, and air transport aviation. A helicopter pilot involves a type of training very different from that of the traditional pilot license. The ability to safely control a helicopter both in the air and at landing sites is essential and requires a different skill level than a commercial pilot who generally has a standard landing and take-off location that is well marked and prepared for his arrival. That explains why the selection process for the Qatar Aviation services field is so difficult. There are different types of tests and strict procedures to follow. That leads to the path of excellence and ensures that the right kinds of personnel are hired for a particular position. That is the main idea of leading the way to success in the modern industry, where competition is beyond expectations. Aviation jobs receive individual attention from all the enthusiastic staff interested in making a successful career in this field. This dedicated and intelligent staff can carry forward the growth and confirm the fine line of solutions. There are different types of requirements, which are needed to be taken care of in various ways and lead to a beautiful range of new job vacancies. 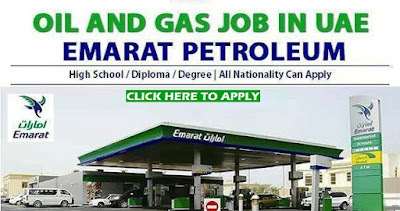 Latest Jobs in Emarat Petroleum Dubai. Securing the latest jobs in the best companies is becoming more difficult due to two reasons: first, the hiring process has become more complex and the automating most processes, therefore, replacing the manual effort. Thus, job seekers are required to spend more time evaluating themselves and must understand how their skills and background fit better with the applied position. Another essential skill to get a job at the best companies is to have excellent communication skills so you can effectively present your skills and experience to employers. But with Emarat Petroleum, things are different. The search for employment in today's world has become much more comfortable than it was before the advent of the Internet age. Nowadays, preferences are provided to the profiles that are being loaded through the official website. Therefore, in the current scenario, it is suggested to upload your curriculum vitae directly to the company's website after finding the relevant work in the portal. Following the trend of job search around the world, the job search in Emarat Petroleum Dubai has also become more user-friendly for applicants, and you can see that the career section of their website is more interactive than any other part. The career section of the website Emarat Petroleum is very user-friendly and can be accessed even from mobile phones. Therefore, wherever you are, you can always be aware of the job offers in Emarat Petroleum Dubai and around the world. Job application now one day does not end with the publication of the curriculum. The follow-up of the subsequent request is also gaining importance with each passing day. Applicants must follow up on their application in the form of mail or calls and sometimes the company uses these calls as another aspect of their interest in the job opportunity. Another benefit of the job search in Emarat Petroleum Dubai is the number of open positions. According to the company, there are more job vacancies than people think and, sometimes, the job remains open in the long term just because recruiters do not want to make lousy hiring and, So much if you think you have the opportunity to find the right job keep looking. With the increase in the use of digital communications in the search for employment, the search for the latest jobs in Emarat Petroleum Dubai is being simplified more and more. The new generations prefer to use digital communication instead of direct communication. Just click on the Apply button when they see some relevant job offers without going through the details of the requirements. As a result, some requests are received, and recruiters in Emarat Petroleum Dubai have to make the contracting process more complete. Therefore, looking for a job in Emarat Petroleum Dubai has become more comfortable than ever. However, the recruitment process has become more engaging, but if you have the skill and experience, you can use digital communication in your favor and get the job of your dreams.